Processor Sockets - Intel and AMD Socket Types - PC Buyer Beware! 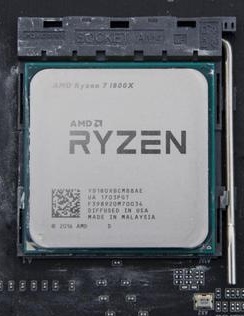 This page of this website is devoted purely to the many different types of desktop PC processor sockets used by Intel and AMD processors on ATX motherboards specifically for one or more ranges of their processors. There are several free tools that identify the make/model of CPU in use on a desktop or laptop PC. I use Speccy. Other tools that provide that information are CPU-Z and the Belarc Advisor. Of course, you can identify the make/model of CPU by opening the case and removing the cooling unit and any thermal past on the CPU that is covering that information (shown below). AMD Ryzen 7 1880X processor (CPU) in its socket on the motherboard. For detailed information on desktop processors, visit the The Intel and AMD processors used in desktop PCs section of this website. For information on installing a processor, visit the Installing the processor (CPU) and its heatsink-and-fan or liquid-cooling unit page of the Build Your own PC section of this website. The pace at which the socket types have been changing has slowed down considerably since the heyday of the desktop PC, which is in decline compared to tablet PCs and smartphones, now enjoying their heyday. Personally, I don’t see desktop and laptop PCs becoming redundant any time soon. I would much rather have a laptop PC than any tablet and I use a desktop PC at home. Laptops are still relatively expensive. If I want to upgrade my desktop PC to the latest hardware, I just have to back up my files and go online and buy a motherboard, processor and RAM bundle costing about £150. Then it’s just a question of reinstalling Windows, my software and restoring my files. Microsoft’s ISO download of Windows 10 is always right up to date. Gone are the days when you had to create a ‘slipstreamed’ install disc that added Service Packs to an earlier Windows install disc. The following post deals with how to obtain the Windows 7/8.1/10 downloads to create an installation disk. The alphanumeric model names of the ranges of processors that Intel and AMD manufacture contain important information about them. The following article provides the information you need to understand what the numbers and letters in the model number mean. 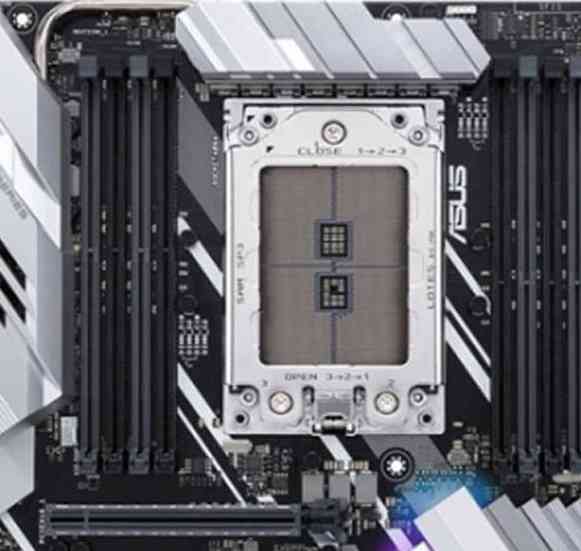 Visit the Annotated images of ATX Socket LGA775, Socket A and Socket 939 motherboards page on this website to see annotated images of those two socket-type motherboards. Although they can be very different electronically, CPU sockets all look similar at first glance, being square and about the same size no matter how many processing cores the processor itself contains – processors get thicker as their core number increases – and can be seen immediately when examining a PC’s motherboard. AMD and Intel motherboard sockets are never interchangeable; they can only be used by the products of the motherboard manufacturers that they have been designed to support. The rate at which Intel and AMD were changing the type of motherboard sockets that their desktop PC processors use was confusing as well as being infuriating. It meant that even if the motherboard form-factor remained the same (ATX or micro-ATX), every time the type of processor housing changed or there were technical changes to the existing platforms, if Intel was your choice of manufacturer, a new motherboard usually had to be purchased if you wanted to upgrade from one type of socket to another. Or having to that was necessary for a more advanced processor that used the same socket type. You had no choice in the matter because the previous processor housing was then no longer supported. AMD provided far better backward-compatibility of its latest processors with its previous socket type, but, even with AMD, when a radically new CPU architecture came into being a new motherboard was required. But now that the market for desktop PCs has slowed down considerably since smartphones and tablets became the most popular form of PC, the rate of change of CPU sockets has also slowed down considerably. Computer users are still using their desktop and laptop PCs but are making them last much longer than was the case when the PC was unrivaled. There was a large increase in PC sales when support for Windows XP ended in June 2014, so, as Windows 7 gets older and more PC users are forced to upgrade to Windows 10 or buy new PCs, there will probably be another similar increase in PC sales that will spark off further technological developments. That said, the dominance that the desktop PC enjoyed has gone forever. The image at the top of this page shows a zero-insertion-force (ZIF) processor socket. The pin holes match the pin layout of the processor and so, when aligned correctly, the processors that the socket supports should just drop into the socket without using any force. 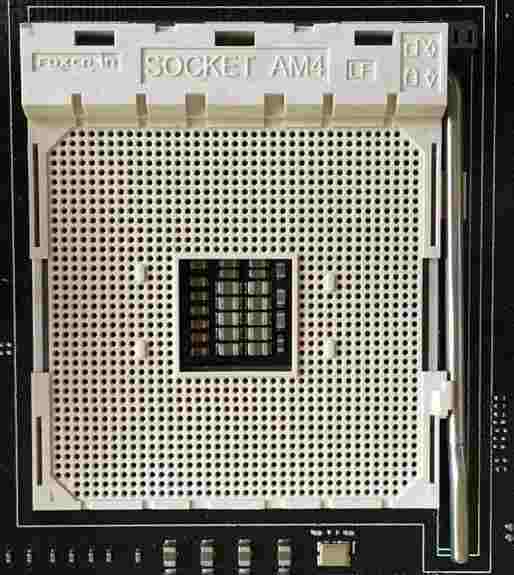 The processor is dropped into the socket with the brown arm at the bottom of the socket raised. When the processor is inserted, the arm is lowered all the way down, thereby fixing the processor into the socket. AMD has always used pins on its processors. Intel used to use pins but then changed to using metal contact points on the processor that match metal pits in the socket. The heatsink and fan cooling unit is fixed to the plastic protrusions in the middle of the left and right sides of the socket shown in the image above. Visit the following page that provides access to tables containing all of the technical specifications (socket type, code name (Haswell, Ivybridge, Skylark, etc.) clock speed, supported instruction sets, caches, etc.) and other information, such as the dates of release, of all of the processors made by AMD and Intel up to the present. The earliest processors are listed first. The further down the list a processor appears, the more recent it is. Look down the Socket/Slot column for the socket type for a particular model of processor. In March 2017, the new AMD Ryzen processors that use Socket AM4 were not yet included in the Techarp Comparison Guide, linked to below. The following post provides information on them. 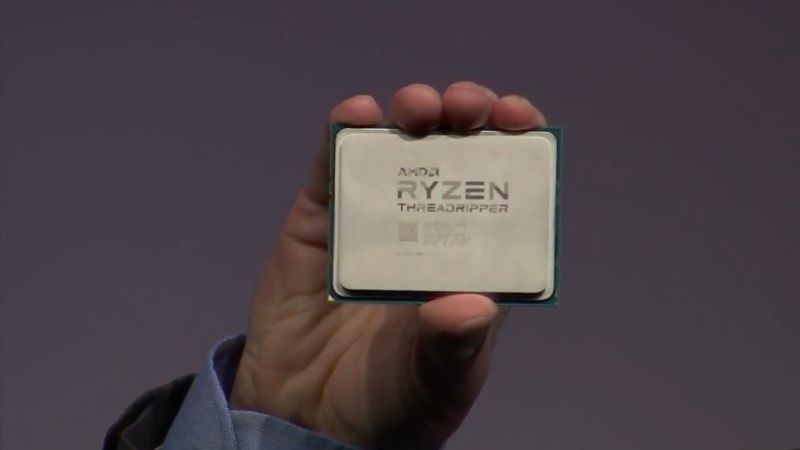 Note that the new AMD Ryzen Threadipper models use the new rectangular Socket TR4. There are three Threadipper models – 8, 12 and 16 cores. The processor, shown held by hand in the image below, is enormous, requiring an enormous socket. Below that image, the Socket TR4 itself is shown in an image of an ASUS PRIME X399-A motherboard (£280 in December 2017). 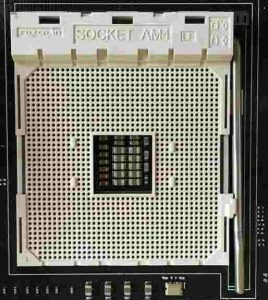 This is AMD’s first LGA (Land Grid Array) socket that has the pins in the socket instead of on the processor, which is called Pin Grid Array (PGA). All of Intel’s processors have been LGA for over a decade, starting in 2004. The Threadipper CPUs only have metal contact points on the bottom of the processor (LGA). The other Ryzen CPUs still use pins on the processor (PGA). The following list of CPU sockets for desktop PCs starts with the earliest and ends with the latest types (2008 to 2015), from left to right: Socket type, year(s) in use, Wikipedia page. The Wikipedia page provides the CPUs that each socket type supports.